Celebrating on the famous Monza track among the jubilant Tifosi that chanted "Sebastian" for third placed Ferrari driver Sebastian Vettel and booed winner Lewis Hamilton, it was a quick change of pace to be on the gorgeous St George's Terrace for post-race drinks and then in the heart of Milan just three hours after the chequered flag. It sounds stressful and rushed, but the bonus of having Thomas Cook Sport take care of your weekend logistics, organising as much as the race ticket, flights, transport and hotel means your only concern can be on maximising the four days in Milan that also encompassed Formula 1's Saturday and Sunday at Monza. And with the freedom to roam, I certainly did. Despite the ongoing torrential rain through all of Saturday, I was able to take in most of the circuit's famous corners including the Parabolica, the Ascari chicane and Lesmos as GP3 and F1 cars tip-toed around the conditions. But with the weather refusing to relent, a switch to the cover of the central grandstand, in parallel with the finish line, ended up being the moment where Thomas Cook Sport's flexibility, with the personal touch from its excellent reps, shone. Despite our deadline to return to the buses coming before qualifying would resume, a quick call to our reps asking to remain to watch the session was returned immediately with the provision of an extra bus for all who wanted to stay and watch the full duration. What could well have been a washout became the unforgettable experience of watching Hamilton defeating Michael Schumacher's record for pole positions in F1 thanks to a masterful wet lap. And Sunday was just as good. Thomas Cook Sport's use of St George's Terrace allowed the group to skip most of the queues and kept journey time down to a minimum, meaning I was in place for the fantastic slipstreaming-filled GP3 race that opened the day's action. 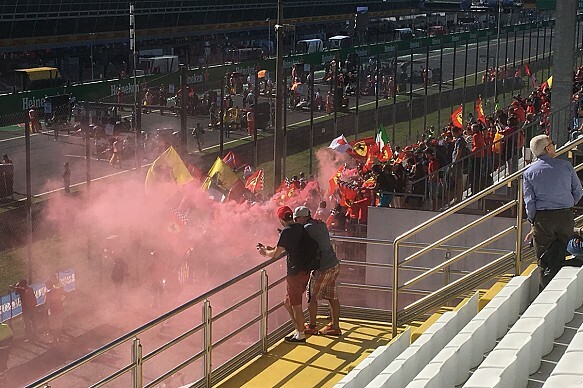 Sitting just feet away from the Ferrari fans with their banners, flags and red smoke only heightened the atmosphere as Luca Ghiotto turned his Saturday setback into a Sunday Formula 2 win and the locals roared as he crossed the line. A great pretext to the main event, the noise from the split Ferrari/Mercedes fans in my stand created an atmosphere that continued right up until the driver's parade. It then hit fever pitch as the race started and both Vettel and team-mate Kimi Raikkonen started to make up places, with fans cheering as if it was AC Milan scoring against Inter Milan. 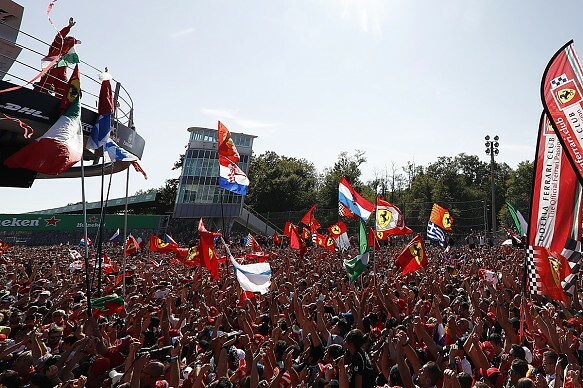 With Monza famous for its post-race track invasion and its Ferrari celebrations, I made sure that as soon as Daniel Ricciardo's pursuit of Vettel's podium place fell away I was in position to join the Tifosi. One mad crush later, I was on the track and running with the fans up close to the podium and taking in those celebrations as Vettel repeatedly thanked the supporters, and Hamilton expertly handled the booing with a sly dig that Mercedes' engines are better than Ferrari's. Again that opportunity was possible thanks to Thomas Cook Sport's flexibility, opening up a free bar at St George's Terrace an hour after the race, but holding off on departures until six so we could soak up the atmosphere. 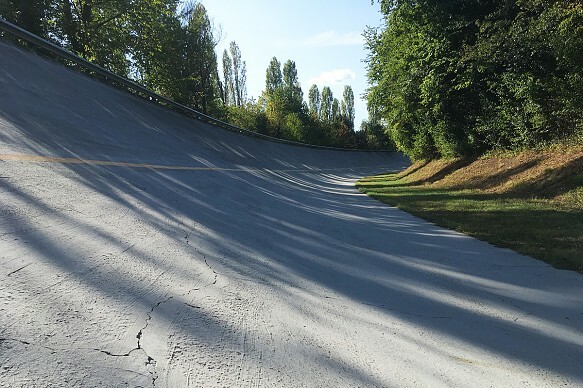 That meant on the way out, I could climb a well-worn steep hill and clamber over a broken fence to get onto the famously daunting old Monza banking. The sheer scale of its rise simply can't be conveyed without standing on it. The terrace was then a fine way to end the weekend, with the several hundred people on the very popular Thomas Cook Sport bookings mingling and comparing their experiences of Monza and their journeys. 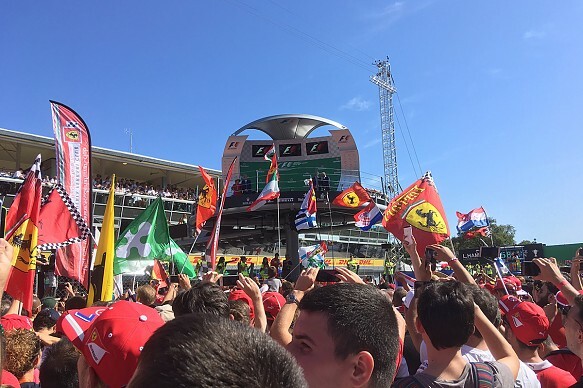 My main takeaway from talking to the group was the vast variety of people on the trips, whether it was a retired woman who regularly takes in flyaway grands prix or a couple getting the chance to support Ferrari at its home race. Whether you were an individual or part of a group, Thomas Cook Sport frequently put on drinks receptions and kept in touch to make sure no one felt isolated or lonely if they were travelling alone. With the excellent Sunday night out the way, it was up to us to spend most of Monday however we chose ahead of the bus transfer back to Milan-Malpensa airport in the evening. After mastering Milan's metro, a long walk to the Sforza castle and its incredible gardens kickstarted my morning, with the city's gate Porta Sempione impressively overlooking it. Heading back to the Duomo, I tried local food such as Liuini's incredible Panzerotti and gelato before then touring Milan's famous shopping district - with detours to the Ferrari store and a shop dedicated to Gulf's motorsport heritage. Once back at our Ibis hotel, a basic but good room on offer for three nights, a smooth bus transfer took us back to Milan-Malpensa with plenty of time to spare, ensuring that all the logistics both there and back were as stress-free as possible. Thomas Cook Sport's handling of all the usual holiday stress such as flights, hotels, transport made for a laidback, relaxing weekend, in which I could focus entirely on making the most of Milan and the fantastic Monza weekend. With pre-registration bookings opening for the Austrian and German Grands Prix, it's a great way to experience the best of Formula 1 - without you having to put in all the groundwork first. Is it possible to find a work-life balance in motorsport?